Acroyoga is a combination of yoga, acrobatics and therapeutic arts. Practiced in pairs or small groups, acroyogis work and play together to create balances, sequences, flows and healing hang- outs. You don’t need to be super-flexi and strong, or a mega experienced yogi or acrobat before you start. Practicing acroyoga will build flexibility and strength, but mainly it should be tried because it’s such good fun! It will certainly give your laughing muscles a good workout. The workshop will start with a fun warm up and initial explorations to working in groups as flyers, bases and spotters. We will then start to introduce you to some of the basic poses of acroyoga. We’ll stop for a break before working on moving between the poses in a flow and finish with some therapeutic partner work for a relaxing end to an exciting afternoon. Yoga of Dragons are Bongo (aka Steve) and Sam – we have been enjoying Yoga, Acrobatics and Acroyoga since 2012 and have been sharing their love of Acroyoga since 2015. In December 2018 we completed the VanCity Acro teacher training intensive. 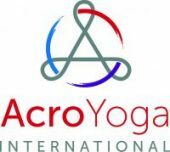 We are also affiliated with Acro Yoga International through their Jambassador programme. We travel and share their practice wherever we go, but are based mainly in the sunny seaside town of Aberystwyth. Join Yoga of Dragons at Damn Hot Studio (what a combination :)) for this feel-good, fun and accessible acroyoga workshop, we can’t wait to lift your mood and your bodies! Limited Spaces, book quickly! Please fill in the form below AND make a payment using the appropriate paypal link. Previous acroyoga experience, if any, or any questions?